Three times I’ve travelled by train from Melbourne to Sydney – never, as it happens, in the opposite direction. I wrote up the first journey in a blog article about my introduction to travel in Australia in 2010-11 [http://www.mikehigginbottominterestingtimes.co.uk/?p=851], when I was completely oblivious of the border between the states of Victoria and New South Wales. The second time, the border was very obvious, because I took the train only as far as Albury, where until 1962 you had to change trains because the two states’ rail systems were built to different gauges: http://www.mikehigginbottominterestingtimes.co.uk/?p=2245. By my third trip, early in 2017, I felt I was beginning to find my way around. I’m used to the fact that the daytime train from Melbourne’s Southern Cross Station doesn’t always leave on time. Indeed, it often doesn’t arrive until after it’s due to depart. There’s a good reason for this. 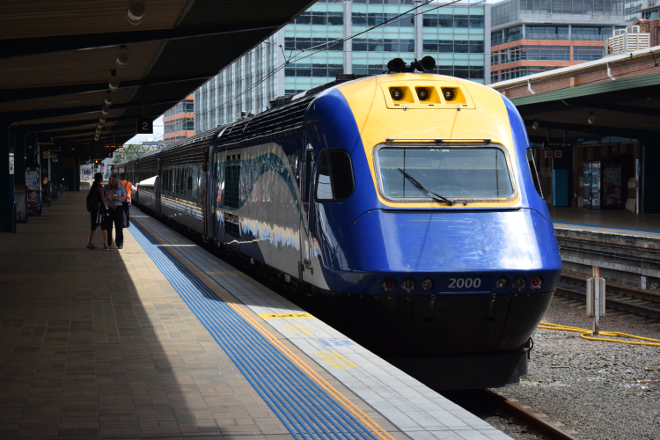 The New South Wales’ Railways XPT trains that operate the inter-state TrainLink service are based on the British High Speed Train. The sound of the power cars’ Paxman engines is immediately recognisable to British ears. These Australian workhorses have been in use since 1982, whereas the British version began operating in 1976, and with overhauls and modifications both continue to give sterling service. The Australian-built version was adapted at the outset for the different conditions down under: the engines are down-rated and the suspension enhanced to cope with inferior track and longer distances; the Australian power cars have headlights at roof level to cope with the darkness of the empty rural areas at night. The trailer cars are completely different from the British Mark III carriages, designed instead under licence from the American Budd company by the Australian builder Comeng. The astonishing thing about these 35-year-old veterans is the intensity of their schedules. While one unit runs seven days a week between Sydney and Dubbo and back (287 miles each way), the others run an intensive seven-day carousel between Sydney and Melbourne, Grafton (in the north of New South Wales, 432 miles each way), Melbourne again, Casino (north of Grafton, 500 miles from Sydney) and Brisbane (over the border in Queensland, 614 miles each way). During this weekly routine each unit is serviced at Sydney only three times. There isn’t a great deal of leeway, which explains why departures from Southern Cross are often delayed. Until they are replaced sometime in the next few years, these tough trains earn their keep and represent outstanding value for money. This entry was posted in Exploring Australia, Transports of Delight on March 30, 2018 by Mike Higginbottom. As I rode up and down the 96 tram-route between my hotel in St Kilda and central Melbourne, I kept noticing an elegant brick church across the road from the Albert Park tram stop, so one morning I took the opportunity to investigate. It’s the parish church of St Silas [http://www.parishoftheparks.com.au/our-building.html], designed in 1925 by Louis Williams (1890-1980), a prolific Australian church architect and a committed proponent of the Arts and Crafts movement well into the post-war period. His life and work are analysed in Gladys Moore’s 2001 Master’s degree thesis: https://minerva-access.unimelb.edu.au/bitstream/handle/11343/38261/300554_MOORE%20vol.%201.pdf. St Silas’ replaced a wooden church that had served the community since 1879 and, if it had been completed to Louis Williams’ design, would have been spectacular both inside and out. Unfortunately, the economic depression of 1929 onwards interrupted construction, and only the chancel without its side chapels, the north transept and the first two bays of the nave were constructed. In 1961 the church was divided horizontally: the ground floor was adapted to serve as the church hall, and the worship space occupies the upper half of Louis Williams’ intended volume. The result is particularly attractive inside, especially as the lack of a south transept brings huge amounts of natural light through a great window that fills the crossing arch. Outside, the result is less satisfactory: the contrary sloping roofs express the staircases within, but the junction with Louis Williams’ sheer brick walls is abrupt. When the nearby 1919 church of St Anselm, Middle Park, closed in 2001 the two parishes combined, and St Anselm’s glass and other fittings were brought to St Silas’. But for this chance visit to St Silas’, where I was made very welcome by the parishioners preparing for Sunday services, I’d have been unlikely to know of Louis Williams’ greatest work, St Andrew’s Church, Brighton (1961-62), which is both a magnificent essay in stripped mid-twentieth century Gothic, taking further the massive proportions of Sir Edwin Maufe’s Guildford Cathedral, and also a neat reuse of a the remains of an older destroyed church, in this case a fire-damaged 1857 nave, in a similar way to Sir Basil Spence’s incorporation of the bombed ruins alongside the new Coventry Cathedral: https://en.wikipedia.org/wiki/St_Andrew%27s_Church,_Brighton#/media/File:St_Andrew%27s_Church,_Brighton,_West_Front.jpg. This entry was posted in Exploring Australia, Gothic Down Under: English architecture in the Antipodes, Sacred Places on November 1, 2017 by Mike Higginbottom. Melbourne’s tram route 96 between the city and the beach resort of St Kilda was formerly a railway line, originally the Melbourne & Hobson’s Bay Railway Company, opened in 1857. In 1987 the line, along with the connected rail line to Port Melbourne, was converted from heavy rail to light rail, regauged from the Victorian railway 5ft 3in to the Melbourne tramway standard gauge, with the overhead line voltage reduced from 1,500v DC to 650v DC. A simple junction into Fitzroy Street allows trams to continue along the Esplanade to a terminus at Acland Street, serving the beach, Luna Park and the shops. In the city, route 96 runs past Southern Cross Station, along Bourke Street and out to East Brunswick. Because it is so heavily used it’s operated by big light-rail vehicles: the five class C2 units were leased and then bought specifically for route 96 in 2008, later supplemented by class E units from 2013. Each unit can carry in excess of two hundred passengers, which is useful not only in rush hours but also for events such as the St Kilda Festival and the Australian Formula 1 Grand Prix. It’s a hugely popular route, quicker and more comfortable than alternative tram routes between St Kilda and the city: http://www.theage.com.au/news/national/tram-96-travels-tracks-to-glory/2008/03/07/1204780065938.html. St Kilda railway station is barely recognisable, though it’s the oldest surviving railway building in the state of Victoria, opened in 1857. It was the subject of a controversial redevelopment in the late 1990s, when the station building was converted to shops and an apartment block with a Woolworths supermarket was built on the site of the goods yard. As you sit in air-conditioned comfort on a fast modern tramcar, you pass immediately recognisable steam-age railway stations, no longer usable because of the height of the platforms, all of them converted to other uses. I called at the Albert Park station, which is a railway antiques showroom, where I was offered a working Melbourne tram destination indicator for A$1,000: http://www.melbourneplaces.com/melbourne/railway-antiques-restored-furniture-coffee-and-cakes-at-the-albert-park-station. It’s hardly surprising that National Geographic nominated route 96 as one of the world’s best tram rides: http://www.theage.com.au/multimedia/2008/national/tram/index.html. This entry was posted in Exploring Australia, Transports of Delight on October 26, 2017 by Mike Higginbottom. As you would expect of a tram city, there is a Melbourne Tram Museum, in the former Hawthorn tram depot, not far from Boroondara Cemetery. The Museum has an encyclopaedic collection of vehicles dating right back to the cable-tramway (which began in 1885 and finally expired as late as 1940), parked in densely packed lines which make them difficult to see and sometimes impossible to photograph. Its saving grace is that visitors have the run of all the vehicles. This was apparent as I walked through the doors by the cacophony of tram bells. Melbourne Tram Museum is the antithesis of places like Crich or Prague where the interiors of vehicles are mostly treated as shrines unless you’re actually riding on them. I particularly enjoyed the “Karachi W11” tram – a superannuated 1970s vehicle that was decorated to within an inch of its life by a team of Pakistani artists for the Commonwealth Games of 2006. It’s great fun, done up like a Karachi minibus with flashing lights, tassels and all manner of glitter and carrying the number of a Karachi bus-route. Originally fleet-number 81, dating from 1977, it was the first of the Z1 class, one of the generation of Melbourne trams that began to replace the long-lived W class which are still the emblem of the city’s transport. The Karachi tram’s side-panels carry the message “Love is Life” in English and Urdu, and inside are invocations in both languages to “Respect your elders” and “Travel in silence”. The newly decorated tram ran on the City Circle for the duration of the Games, March 14th-26th 2006, and again on Friday evenings during the summer of 2006-7 as part of the City of Melbourne Living Arts Program. Otherwise it remained in store until it was transferred to the Museum in June 2015. By far the most amusing tram in the city, it deserves an occasional outing as an alternative to the celebrated Colonial Tramcar Restaurant. Because the Museum is staffed by volunteers it’s only accessible on open days, and it’s well worth a visit: http://www.hawthorntramdepot.org.au. This entry was posted in Exploring Australia, Life-enhancing experiences, Transports of Delight on September 14, 2017 by Mike Higginbottom. The rail-traveller’s approach to the Puffing Billy Railway is by suburban electric train from the City Loop eastwards to Belgrave. Though the route is a conventional trip through the Melbourne suburbs, it’s noticeable that further out the track has been expensively lowered into a steep-sided cutting to eliminate dangerous at-grade road crossings. Towards the end of the journey, the line changes character. After Upper Ferntree Gulley the broad-gauge electric multiple unit squeezes itself on to a rural single line with passing loops until it reaches its terminus at Belgrave. The reason for this is that when the 1889 line as far as Upper Ferntree Gulley was extended ten years later it was built as one of four experimental 2ft-6in gauge branch lines, an extreme expression of Victorian Railways’ commitment to provide rail service even to remote communities in the days before motorised road transport. Even though none of these narrow-gauge lines ever made a profit, the line from Upper Ferntree Gulley to the far terminus at Gembrook operated until a landslip in 1953 gave VR an excuse to close it. The manifest popularity of the numerous “farewell” specials run as far as Belgrave motivated enthusiasts to raise the possibility of running it as a volunteer-operated heritage railway, the Puffing Billy Railway, named after the local nickname for the narrow-gauge trains. Though VR management was initially sceptical, the scheme went ahead, with the narrow-gauge trackbed from Upper Ferntree Gulley to Belgrave converted to broad gauge and electrified. Belgrave reopened as a suburban station in 1962, the same year that the Puffing Billy Railway opened its service as far as Menzies Creek, extending it to Emerald (1965), Lakeside (1975) and to the original terminus at Gembrook in 1998, a total journey of fifteen miles. The result is an absolute delight for tourists as well as enthusiasts. The clearances are such that passengers are encouraged to dangle their legs out of the train windows. The route passes through beautiful countryside and crosses two spectacular timber viaducts at Monbulk Creek and Cockatoo Creek. The railway’s preservation credentials are impressive. It possesses every surviving VR narrow-gauge locomotive, all but one of which are operable, as well as one magnificent G-class Garratt locomotive which is capable of hauling eighteen-coach trains. It runs trains every day of the year except Christmas Day, with a core group of paid staff alongside a welcoming, cheerful team of volunteers. The Puffing Billy Railway has now run for longer as a heritage line than it did as part of a main-line network. It dates back to the time when enthusiasts first began to believe they could run a railway, and rail professionals learned to trust them. As such it stands alongside Britain’s narrow-gauge Talyllyn Railway (reopened 1951) [http://www.talyllyn.co.uk] and standard-gauge Bluebell Railway (reopened 1960) [http://www.bluebell-railway.com] demonstrating that committed, hard-headed amateurs can make heritage rail a practical success. Perhaps the ultimate accolade is a proposal for Victorian Railways to restore an original broad-gauge Tait electric multiple-unit set to operate a complementary service between Flinders Street and Belgrave in conjunction with the Puffing Billy trains: https://en.wikipedia.org/wiki/Tait_(train)#/media/File:TaitNewportWorkshops.jpg. This entry was posted in Exploring Australia, Life-enhancing experiences, Transports of Delight on September 8, 2017 by Mike Higginbottom. The architect William Wilkinson Wardell (1823-1899) is a classic example of the British expatriates who made their career in the growing cities of mid-nineteenth-century Australia. A Londoner, born in Poplar, a Catholic convert and a pupil of the Gothic Revival architect A W N Pugin, he had designed or restored at least thirty English churches when at the age of thirty-five he and his family emigrated to Melbourne and he was appointed Government Architect. As such he was responsible for the design of Government House (1871-6) in an Italianate style that hinted at Prince Albert’s Osborne House on the Isle of Wight. He also designed the noble Gothic St Patrick’s Cathedral (1857-1897) and, later in his career, St Mary’s Cathedral, Sydney (1868-1928). In his private practice, which ran alongside his government work, he built the flamboyant ANZ Gothic Bank, Collins Street, Melbourne (1883-1887) and the Australasian Steam Navigation Co Building, The Rock, Sydney (1884). Inevitably, his position in Melbourne’s government and Catholic circles meant that he built numerous parish churches, including St Mary’s Catholic Church, East St Kilda (1858), where Wardell and his family worshipped, and the magnificent St Ignatius’ Catholic Church, Richmond (begun 1867), both in the basalt bluestone characteristic of Victoria, quarried in north Melbourne. William Wilkinson Wardell is an example of the pioneering English architects – others include the Southwark-born Edmund Blacket (1817-1883) and Ipswich-born Benjamin Backhouse (1829-1904) – who brought their expertise to Australia in the days before the new colonies could call on a generation of Australian-born architects. This entry was posted in Exploring Australia, Sacred Places, Victorian Architecture on July 22, 2017 by Mike Higginbottom. The history of European settlement in Australia is founded on the convict experience which began with the landing of the First Fleet in Sydney in 1788. Three sites in Tasmania, which was founded as a penal colony in 1803, illustrate the rigours and the remoteness of the places to which offenders were transported from Britain until as late as 1853. Richmond Gaol is sufficiently intact to show the actual cramped conditions of the prisoners’ physical environment. Port Arthur, though ruined, is extensive and has sufficient remains to illustrate in breadth and detail how convicts and their guards lived and died. Only vestiges remain of the Cascades Female Factory in suburban Hobart, yet its imaginative restoration and interpretation, using sculpture and live actors, makes the memories it carries evocative and easy to comprehend. In the upside-down world of convict settlements down under, segregation created odd distinctions. Female convicts were customarily sent to “factories”, effectively workhouses, for three reasons: either they were sheltered because of good behaviour on the voyage from Britain, or they were thought to be capable of reformation if removed from criminal influences, or they were so reprehensible that they needed containment away from the main prison system. These categories were, at the insistence of the Lieutenant Governor, Sir George Arthur (1784-1854), “on no account to be suffered to communicate with each other”. The factory at the Cascades was designed by the Colonial Engineer John Lee Archer (1791-1852), and was repeatedly extended. The first prisoners arrived from the overcrowded Hobart Gaol in December 1828, and further courtyards were added in 1832, 1842, 1850 and 1852. From 1856 the site was redesignated as a prison, and female prisoners left the site completely in 1877. Nearly all the buildings were subsequently demolished, apart from some of the substantial boundary walls. The only remaining historic building is the Matron’s Quarters of 1850. This emptiness is put to remarkably good use. The archaeology has been investigated and reburied to conserve it, and the outlines are indicated by gravel paths and paving, walls of stone chippings in metal net cages and structures and sculptures in rust-coloured iron. This apparently unpromising minimalist approach is surprisingly effective, because it challenges the visitor’s imagination, and those who like their history brought to life can follow actors in character around the site telling the stories of those who lived and worked here nearly two centuries ago. In a different way to the film-set completeness of Richmond Gaol and the mown and manicured ruins at Port Arthur, this site informs the imagination. I liked it. This entry was posted in Exploring Australia on June 28, 2017 by Mike Higginbottom. I’ve wanted to visit Port Arthur ever since I read Matthew Kneale’s haunting novel English Passengers (2000): https://www.amazon.co.uk/English-Passengers-Matthew-Kneale/dp/0140285210/ref=sr_1_1?ie=UTF8&qid=1489093076&sr=8-1&keywords=Matthew+Kneale+English+Passengers. It’s a beautiful, miserable, fascinating place. Set in a cove near the southern tip of Tasmania, the penal colony was founded in 1833 as a high-security jail for transported prisoners who were too recalcitrant for the main convict settlements of New South Wales. Port Arthur was practically escape-proof: the only direct land-access was by a narrow spit at Eaglehawk Neck. By sea there was nothing to the south but Antarctica, to the east New Zealand, to the west the continent of Africa. Islands in the cove were given over to the first reformatory for boys in the British Empire, Port Puer, and a cemetery, the Isle of the Dead, where convicts, guards and the guards’ families were buried in strict hierarchical order. The modern tourist site also contains an area commemorating the thirty-five people who died in the Port Arthur Massacre, when a lone gunman on a killing spree fired on visitors in the café, gift shop and car-park areas on April 28th 1966. When the penal colony was first founded there was much work to do, and the settlement was intended to be self-sufficient. The Penitentiary itself was initially built as a water-powered mill. Though Port Arthur was built by physical convict labour, its design reflected contemporary ideas about using psychological punishment to alter prisoners’ minds. The dominant building on the whole site is the huge Convict Church, its central position symbolising the place of religion in the process of reforming wrong-doers. The Separate Prison was built to the specification of Jeremy Bentham’s aborted Panopticon project, which allowed all inmates to be supervised from a central point, without individual prisoners having any personal contact with any other individual prisoner or guard. The idea was that prisoners would have time to contemplate their predicament and the evil ways that brought them to it. The outcome was that some of them simply went mad. This entry was posted in Exploring Australia, Victorian Architecture on June 22, 2017 by Mike Higginbottom. The town of Richmond (population 880), fifteen miles north of Hobart, is a popular tourist spot with links back to the early history of European settlement in Australia. In the early years of the nineteenth century settlers established themselves around Hobart and began to supply wheat to the rest of the colony of New South Wales, of which Tasmania formed part until it became a separate colony in 1825. A ford across the Coal River provided a vital link between Hobart and the east coast of what was then called Van Diemen’s Land, and the British lawyer John Thomas Bigge (1780-1843), sent from London to report on the colony’s administration, recommended replacing the ford with a bridge. Richmond Bridge, the first stone-arch bridge and the oldest bridge still in use in Australia, was built by convict labour in 1823-5, and the surrounding settlement was designated and named in 1824. Richmond Gaol, opened in 1825 and enlarged in 1832-33, survives almost intact as a historic site, giving a vivid impression of the misery of convict life. It remained in use until the mid-1850s. Richmond grew to be the third biggest town in the colony. Its Catholic church, St John’s (1836), is the oldest in Australia, designed from a plan provided by the Bath architect Henry Edmund Goodridge (1797-1864). It was extended, making clumsy use of a plan by A W N Pugin, in 1858. The Anglican parish church of St Luke, designed by the Colonial Engineer, John Lee Archer and built with convict labour, opened in the same year. An alternative road, the Sorrell causeway, opened in 1872 and bypassed Richmond, leaving it as a reminder of the Georgian origins of Tasmania. The Richmond Arms Hotel, formerly the Commercial Hotel of 1888, replaced a predecessor destroyed by fire. It’s one of a number of attractive places to eat and drink in the village: http://www.richmondarmshotel.com.au. Richmond thrives on its tourist trade, an easy drive from Hobart and accessible by bus: http://www.richmondvillage.com.au/home.html. This entry was posted in Exploring Australia, Victorian Architecture on June 16, 2017 by Mike Higginbottom. My excellent travel-agent Lisa Machin at Sheffield Travel Centre Ltd [http://www.sheffieldtravel.net] has a knack of finding comfortable hotels for me even in unlikely places, and sometimes she excels herself. From the bottom of the hill the Lenna Hotel, Hobart [http://www.lenna.com.au] looks like a conventional block of modern hotel rooms built above a carpark. It’s only when the taxi turns into the entrance that Lenna itself, a largely intact and well-restored Victorian villa, comes into view. The rooms, therefore, are modern and fully up to specification; the lobby, lounge and restaurant are splendidly Victorian. I was very happy to spend my stay in Hobart there. Lenna – the word apparently the Tasmanian indigenous word for ‘house’ or ‘hut’ – was built on what was then a bare hillside overlooking the harbour by a whaling captain and ship-owner, James Bayley (1823-1894), in the 1860s. It was bought by Bayley’s brother-in-law, the ship-owner and merchant Alexander McGregor (1821-1896), whose brother John had built the Gothic Hillcrest next door. James Bayley requested that the original hip-roofed house should not be destroyed, and so Alexander McGregor incorporated it into the taller Italianate structure that he built between 1874 and 1880. Mr McGregor could observe maritime comings and goings in Hobart harbour from his lookout at the top of the house. The current hotel-owners are rightly proud of this and make it accessible to guests. In other parts of the world this feature is known as a “widow’s walk”, presumably because it allowed widows during heavy mourning to take exercise unobserved while etiquette prevented them appearing in public. Eventually, in 1914, the house passed to Sir Alfred Ashbolt (1870-1930), a rich businessman described in the Australian Dictionary of Biography as the “undisputed leader of the commercial community in southern Tasmania” in the final years of his life. Lenna eventually became a hotel in 1973 and now belongs to Lloyd and Jan Clark, who treasure its original features. This entry was posted in Exploring Australia, Life-enhancing experiences, Victorian Architecture on April 17, 2017 by Mike Higginbottom.